Sales of $4-million-plus homes dropped by nearly half in Vancouver. Luxury homes overlooking the water in West Vancouver, B.C. Sales of luxury properties declined sharply in three of Canada's biggest cities last year, realtor Sotheby's says. TORONTO — Sales of luxury properties declined sharply in three of Canada's biggest cities last year as homebuyers retreated amid tightened mortgage guidelines and higher interest rates. A report released today found that Vancouver, Toronto and Calgary saw large drops in high-end real estate sales in 2018 as the markets dealt with a number of headwinds including tighter supply, higher foreign buyer taxes and strained economic conditions due to the falling price of oil. 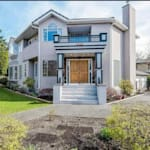 Sotheby's International Realty Canada says the number of homes that were sold last year for $1 million and higher, dropped 26 per cent in Vancouver while home sales priced $4 million and more fell 49 per cent year-over-year. Watch: Canada's most expensive condo just got a price cut. Story continues below. In Calgary, sales of homes priced at $1 million or more fell 10 per cent in 2018, compared with a year ago, as crude oil prices plunged in the last quarter of the year. Only one home sold for more than $4 million in that city in 2018. In the Greater Toronto area, sales of homes worth $1 million and more fell 31 per cent, while sales of homes over $4 million and more dropped 40 per cent. The report, which examined the high-end housing market in Vancouver, Calgary, Toronto and Montreal, pointed out that Quebec's largest city was an anomaly even though there are signs that sales momentum is beginning to plateau. Montreal home sales over $1 million and more increased 20 per cent year over year, while homes sold for more than $4 million fell eight per cent.